When humans first arrived on Eeventide, a Helver formed on their arm which tethered them to the planet. Gaining the ability to levitate and fly, people became known as Drifters and created factions known as Guilds. However, it wasn’t long before a select few Skyborn Drifters betrayed the Angel Guild and established the Order. A massive battle ensued, and the Order loomed over the horizon with a terrifying creature they forged called Council of Galaxies. Skyriss Delcastle answered with a beautiful creature that covered the skyline itself called Alana the Star Formation, but also had to enlist the help of the enemy Dragonis Guild just to come to a stalemate. A remnant of Skyborn remains, striving to rebuild their destroyed castle. 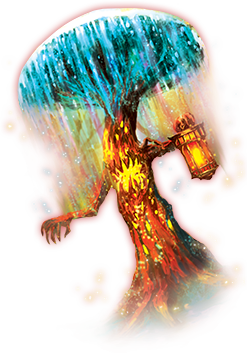 Ever since the galaxy-sized nebula creatures collided in the skies over Eeventide, there’s been a surplus of stardust & other magical compounds that rained down during the aftermath. This excess supply has led to Drifters far and wide forging new creatures. 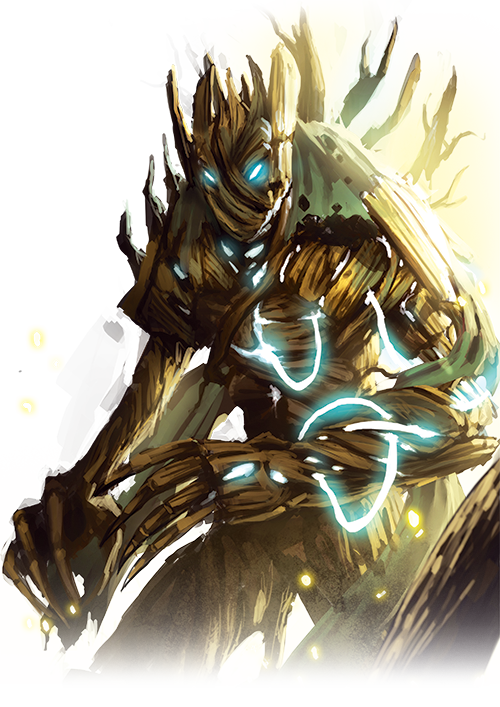 The emergence of 2 new Guilds, Treeforge & Shardveil, brings all to the brink of war. Shardveil, their ice not limited to any part of the color spectrum, seeks to bring a halt to the chaos by permanently freezing the world. Treeforge and their vast forests of living trees & mushrooms fight to uproot the spreading ice. Which Guild do you choose? Eeventide's sixth year was fast approaching. Much had already happened to this young world, events of great importance and others of fleeting value. But this tale begins elsewhere. A sort of world-between-worlds that was neither Earth nor Eeventide. Somewhere much less bright, where the light of the stars and the infrared nebula surrounding them could never reach. In a place unidentifiable...there was a voice. A voice called out into the dark, each word echoing like a harsh whisper. "Carcery...Carcery...Carcery..."
"Cassius?" replied a voice, this time belonging to the mechanical ‘wizard’ known as Carcery, or at least, what was left of him. "You're alive..." said the loud whisper. "Chance Cassius," confirmed the motionless wizard. There was nothing, only darkness and the sound of their trailing voices. After the longest time, the dying illusionist replied, "What for?" "To kill,” said the voice, “Oliver Rose..." It made a long, drawn out wheezing noise that sounded more like a creature than the Count who resided in Morenia Castle. It was so sickly; it would have sent shivers up Carcery’s body if he still had one. Foolish phantom, Carcery thought to himself, I was already planning on it. "On one condition..." said Carcery after what seemed like an eternity of silence, "Teach me... Help me... To have a body... In case the branches of the Twisted Tree—fail me..."
The foreign voice moved closer, moving on what sounded like the wind but was actually smoke, “Deal..."